Small Furry Animals - That's it; any interpretation is acceptable. You can trawl through your archives or shoot something new. Either way the image is to be shot on a Pentax or related camera and the winner will be expected to set up and judge next week's competition. The competition closes at midnight Sunday 6th January GMT. Good luck with your entries. It's great to see a good number of entries for the first competition of the New Year. It's not often we've gone over 20 entries for the week recently. Thank you all. The standard of the entries was generally superb with several standing out for me. Please remember that the views expressed on them here are purely my own and of course we all may well have alternative opinions. I note that there have been several unexpected Small Furry Animals included amongst the entries but I'll take them as they come given I said I'll take any interpretation. A good opening entry; indeed a fine photo of the two ducklings. Maybe it could do with a little more space below the birds to balance their position in the frame as they are pretty tight to the bottom edge. A very pleasing entry none the less. So we have the perils of a family of ducklings playing follow my leader chicken on the railway. Having just crossed under the rail one must wonder why they want to cross back again over the top. As to the photo it's a well spotted and taken image. Looks good to me! A well captured squirrel, reckon he was after some peanuts from you. Might it be back focussed just a fraction? None the less a super photo of a squirrel in a classic pose. A small furry...? It looks huge and scary to me on my monitor! Nicely sharp, shame one of his legs ended up just out of frame otherwise superb. Do you take it to bed with you to cuddle up to?! Good composition and exposure. An ahh picture! I do like this because it tells a story. Not only that it is carefully framed with the cat's tail running out to, but not out of the edge of the frame. The grey rabbit (I think it is) in the background is out of focus so isn't overly distracting, but it is a bit. Nicely framed and focussed in a natural looking environment. I might just be tempted to clone out the two branches that run into the squirrel's back as they're a bit like having a tree growing out of someone's head (well nearly) and that wouldn't look too difficult to do. Mind, that could break the rules for some wildlife competitions. All in all though an excellent capture of the squirrel. Certainly accept your interpretation and note it is a fresh photo so suspect it was taken for the competition - so thank you for that. To my mind it suffers from a fairly harsh single frontal illumination that makes its trunk look odd. If you could have used a main light to one side and a modelling light to the other it would have given it some depth. Maybe also angling Ella slightly to maKe it more obvious it's an elephant rather than an odd looking teddy! I've been trying to work out what the relevance of the electronics, architecture and robin books are to the photo for when there are words in a photograph the eye tends to be drawn to those. If they are not really relevant to the photo why not crop off the sides to lessen the distractions? If a book had been about elephants and Ella was angled to be seen supposedly reading it then that book would then have most certainly been relevant to the photo. Who was it who said Pentax's can't do action shots? Show them this. Alternatively make this into a spot the ball competition! Just look at the concentration in the eyes. Good composition, good everything. Love it! What a fun photo! I wonder what it's spotted on the lily pad? Is it a tiny frog? Very good. Shaney is looking as though she is wondering what you're up to. I think that the portrait would be brought out stronger if the neighbour's fence above in the sunlight was cropped off; it would help to bring out the cat's face detail better (plus the fence doesn't add anything to the image either.) The fence post on the left doesn't add anything either so perhaps loose that too? I like the picture of the cat though but it's somewhat lost in the fencing. As presented this has a 'burn out' problem. It is spoiled by the harsh lighting burning out the hair detail on top of the mouse (might be worth trying to recover this detail if you have a raw file of it.) If these had been real animals that might have been difficult to retake but for a still life the lighting was under your control so was presumably manageable. Conversely the squirrel seems a bit diffused caused (I suspect) by the back-lighting and lacks sharpness as its out of the depth of focus. For those a reflector to bounce back light from the front would have tamed the contrast problem and a smaller aperture should solve the sharpness issue to increase the focus depth of field. The potential is there, really just needed getting the lighting / exposure right. This has worked quite well - a fine portrait. You've just about retained some detail in the cat's white fur. Are you aware you can see your own reflection in jake's eyes? This was in my shortlist for a podium place. A very appealing photo. Not sure why it looks so soft in places, however making the young puppy's fur look soft gives us a very 'ahhh' photo so maybe it's deliberate. What I'm referring to is that the blanket Ted is sitting on does look sharp as does the ring but not the adjacent paw. Perhaps some sort of soft filter effect been added in Lightroom? I do feel that if any part of the image is sharp it really ought to be the eyes though. Overall a good capture and reminder of Ted as a youngster. It would be interesting to see the 'out of camera' unprocessed version for comparison. Perhaps you've simply over processed it or something odd happened. I can certainly appreciate your humour in this. Yes, it does look like that! While size is relative, I don't think these would normally be considered small furry animals. Not withstanding given the brief, how does it shape up? Really well in fact. A well composed image. I actually suspect they're looking at you wondering why you were the guilty one putting that pat there and trying to blame them! You are certainly lucky having red squirrels running around your home. Have you tried setting up some natural scenes to try and tempt them to get some photos in a more natural setting? They could be winners. This photo of the squirrel is fine as it stands but is not in an ideal setting for it and while the angle might be how it was in reality it doesn't really look right in the photo. Set up that natural looking environment and people would come and pay money to join you simply to photograph your squirrels. Another red squirrel! This shows that with a source of food available the expectation is that the spot will be visited allowing the camera to be set-up ready to capture the photo. The dark background has allowed the subject to be brought out really clearly with no interfering 'things' growing out of the body. Good shot. And another squirrel! For some reason this is suffering from a severe lack of sharpness and contrast. Either the camera hasn't nailed the focus or it's suffering with camera shake. Shooting through double glazing wouldn't have helped though either but that doesn't necessarily cause that softness (but it won't help!) I just love the antics of the squirrel though going after the birds' fatball. Had it been sharper the animation of the photo would have put it in the running for a podium spot. Good to see the photo of the animal in a natural environment rather than in captivity. For a long telephoto shot it has turned out pretty sharp too especially given the relatively slow shutter speed used. The framing's good, exposure good. Great stuff! A late contender for 'awww' of the week! I don't know (obviously) but I'm aware there are some of these in captivity which allow for good photo opportunities. If it's truly in the wild then it's fantastic. Whichever you've ended up with a good sharp, well exposed image in a super pose. Podium contender for sure. Given all the squirrel photos entered perhaps we need a sub competiton for the best squirrel of the week photo too! So I have to decide on a winner. When I first saw Vic's 'Tilly after the ball' turn up my thought was that would take some beating. There's just something about that dog chasing the ball. True action and not easy to get right! But that captured it perfectly. So despite other entries coming close I'm sticking with that. If it was 100% sharp it wouldn't even look right but it isn't far off that. A great shot, well done Vic. There are quite a few contenders for the next spot and I've awarded it to steadfast for Wot U Lookin At which displaced some earlier contenders. If I could award two top spots this would join Vic's. So what got displaced? Well it was Snakey's Red Squirrel. It's not easy to get a good photo of them, especially in the UK, and this is pretty good. So this must get the award for squirrel of the week too! All the other entries have been appreciated too, there was some seriously tough competition this week. Thanks again for your entries. Over to Vic for the week to come. Congratulations Vic and his fellow podium contestants and to all the HCs, what a great number of entries, good choice of topic JAK and good feedback notes, thank you. Thanks for the competition, choice of subject and your expert eye in judging the entries JAK. Its good to see a healthy entry again after a period of low interest in the weekly competitions. Congratulations to Vic Cross on an excellent winner and his podium colleagues Steadfast and Snakey and also to my HC colleagues. Wonderful challenge, lovely feedback and so nice to have so many high quality entries in this challenge, so a hearty thanks to JAK are in order. 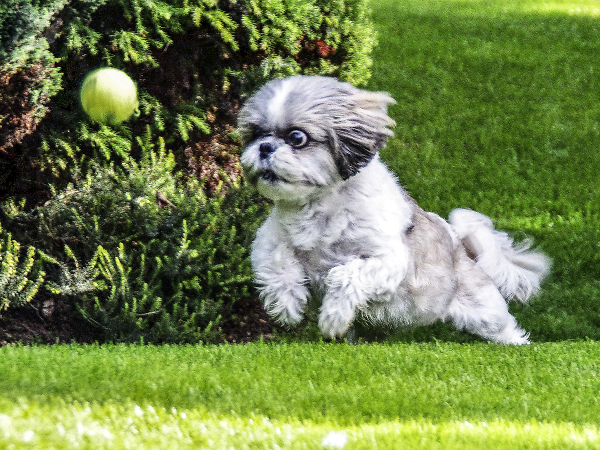 And an equally hearty congrats to Vic for a stunning winning image, that dog is mesmerized by that ball! Super action shot! And congrats extended to Steadfast and Snakey, and my fellow HC's, which award I'm gratified with considering the high quality images here. Thank you JAK. Congrats to everyone else. Runners up and HC's. Now I have to set a new comp. subject. ??? Give me an hour or so and I'll be back with something later today. P.S. Thanks again JAK. A nice early birthday gift. I'll be 80 on Wed. 10th. Jan. So I'll be judging the next comp. with dodgy old eyes. . Many thanks John for a great competition that attracted an excellent number of entries. Congratulations to our winners and everyone else for such a grand set of diverse and well crafted images. Thanks to JAK for a great competition with a good variety of photos and well judged with good comments. Congratulations to everyone, especially Vic for a winning picture. Yes I did notice my reflection in Jake's eyes-well spotted ! Thanks to JAK for the competition, prompt judging and comments. Congratulations to Vic for the winning pic; well done to the podium places and fellow HCs. Congratulations to the winner, the podium places and the other HC's .